What Can Cultural Evolution Tell Us About the Human Conquest of the Planet? The last 10,000 years have been a remarkable period for the human species. As the glaciers of the late Paleolithic retreated, humanity too, retreated from its old foraging ways in small, mobile bands toward increasingly large, sedentary, anonymous groups. In this Neolithic era, we have spread to every corner of the globe, from fertile plains to arctic tundra, deserts, and rainforests. This expansion has been so relentless, that along the way, we have gravely strained the planet’s ecology and its natural resources. How this happened is a great scientific puzzle. The genetic evolution of our species is too slow and gradual to explain these dramatic but rapid changes in the expansion of human populations and group size. Instead, a more plausible explanation is found in another type of evolutionary process rooted in human biology. Cultural evolution, a non-genetic inheritance system wherein ideas and behaviors are spread socially, was already in place, allowing for rapid behavioral modifications, such as tools for transportation, farming techniques, and trading with strangers. In short time spans, these innovations can get preserved and are passed on to the next generations, or to neighboring groups. 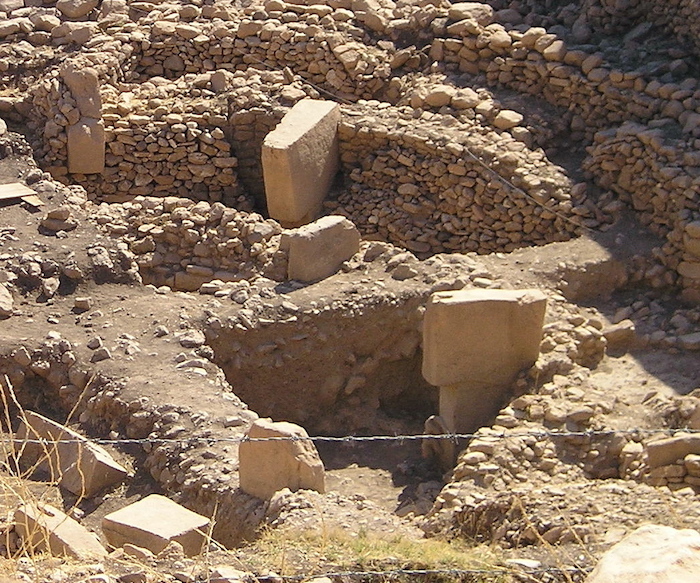 For clues about this mystery, a good place to look is Göbekli Tepe, the world’s oldest known religious temple. It is estimated to be about 11,500 years old, occupying a dry hilltop in southeastern Turkey near the Syrian border. Massive, humanlike stone pillars carved with images of animals such as gazelles and scorpions are arranged into a set of rings. There are many intriguing questions about the foragers who built this monumental site, how they did it, and why. But there is little doubt that it is a pre-agricultural site, and one of the earliest documented examples, religious or not, of foraging people beginning to regularly interact with distant strangers across Anatolia, heralding the birth of large-scale societies. How did human societies scale up from small, transparent foraging bands to the anonymous populations of millions today? And how did these human ancestors, possessing temperaments calibrated for small-scale group living, manage and maintain this momentous transition? The conventional wisdom has pointed to agriculture as the driving force that cascaded humanity into large-scale cooperation. But excavations at Göbekli Tepe are beginning to overturn this idea. The site predates the domestication of plants and animals by thousands of years. Perhaps, agriculture was an initial consequence, before turning into a cause, of social complexity that was already in place. This brings us to another puzzle that Göbekli Tepe points to, and this one is about the cultural evolution of religion itself. How did a handful of polytheistic and monotheistic religious movements spread around the world? And how did this happen even though, in the long run, history shows almost all religious movements eventually fail? After all, it is because of the iron law of religious evolution that, of the tens of thousands of religious traditions that have ever been created, only a few have had any “sticking power” to take root and persevere against the forces of cultural decay. Foraging societies can teach us two important lessons about cultural evolution. One is that many solutions to large-scale cooperation have been cobbled together in rapid historical time. The other is that one such solution was the forging of connections between the supernatural and the moral that took shape culturally over human history. The ethnographic record tells us that the spirits and the gods play a marginal role, if at all, in the rich and varied cooperative lives of foraging societies. As far as we can tell, for most of human prehistory, and in contemporary foraging groups, the supernatural and the moral are largely disconnected. The spirits and the gods know little, have limited powers, and rarely if ever, intervene in the moral affairs of people. But in moving from the smallest scale human societies to the largest and most complex, morality and religion become increasingly intertwined. The power, omniscience, and interventionism of the gods go from relatively rare to increasingly common. Eventually, we get to the present state of affairs, in which the overwhelming majority of believers worship the Big Gods of world religions who demand extravagant loyalty displays and enforce intensely prosocial norms. As these cultural beliefs and norms broaden the cooperative sphere, we see the creation of imagined moral communities that expand at the expense of their rivals through cultural imitation, conversions, high fertility rates, political fusion, conquest, and war. There are of course other accounts of the origins of world religions. Another view is that religious cooperation, in the form of fear of supernatural punishment or the human penchant for costly rituals, is a species-wide adaptation. Other accounts see beliefs in supernatural beings as a natural consequence of human social cognitive capabilities, but discount any active role for these beliefs in the scaling up of the social sphere. Ascetic religious traditions are seen as a mere consequence of some societies crossing a threshold of affluence rather recently, only since the last 2,500 years. So is there evidence that the gods, whether they are real or imagined, had a hand in the scaling up of the social sphere? In one of the most direct tests of this hypothesis, we deployed economic games designed to measure impartial rule-following, and collected extensive ethnographic interviews about how people perceive their gods in eight cultures around the world varying in social scale, subsistence, and religious traditions. Participants played an economic game, in which they allocated coins between a distant co-religionist—that is people who were members of the same religious tradition—but who lived geographically far away, and either themselves, or a local co-religionist. We found that the more participants rated their god as caring about human morality, knowledgeable about human thoughts and actions, and willing to punish, the more they allocated coins to geographically distant co-religionist strangers. But ancient societies could have scaled up by cobbling together cultural and psychological tools that do not extend from supernatural beliefs and rituals. Indeed, some modern societies have done just that. We do know that with the appearance of secular institutions and large improvements in social safety nets, traditional religion has been receding in some parts of the globe. Societies that had climbed religion’s ladder have kicked it away. By 2050, 1.2 billion will have no religious affiliation, making this loose and scattered group the fourth largest “world religion” after Christianity, Islam, and Hinduism, collectively making up the vast majority of the world. As we move deeper into the 21st century, will there be a dramatic religious resurgence, or will more societies pull away from organized religions? The last 10,000 years of the Neolithic were the age of two global developments: the human conquest of the planet and the religious conquest of humanity. As we leave behind the Neolithic age and enter the uncharted waters of the Anthropocene, the forces of cultural evolution are once again center stage. The lasting human impact on the planet’s environment and climate was instigated in no small part by the world religions and their secularized offshoots. Will they now rise up to the challenge of forging a new consciousness of sustainability? Purzycki, B. G., Apicella, C., Atkinson, Q. D., Cohen, E., McNamara, R. A., Willard, A. K., Xygalatas, D., Norenzayan, A., & Henrich, J. (2016). Moralistic gods, supernatural punishment and the expansion of human sociality. Nature, doi:10.1038/nature16980. Pew Research Centre, The Future of World Religions: Population Growth Projections 2010–2050. http://www.pewforum.org/files/2015/03/PF_15.04.02_ProjectionsFullReport.pdf (2015). Ara Norenzayan is professor of psychology at the University of British Columbia, and a co-director of UBC’s Centre for Human Evolution, Cognition, and Culture (HECC). He is the author of Big Gods: How Religion Transformed Cooperation and Conflict. Engage with questions that illuminate our humanity.